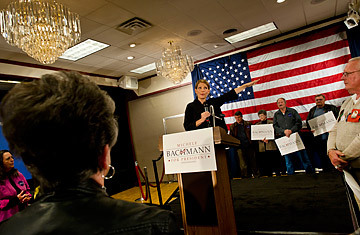 Republican presidential candidate Michele Bachmann speaks in Cedar Rapids, Iowa during a Team Bachmann rally, September 26, 2011. The caller's name was Donna. She came to praise Michele Bachmann, who was a guest on a conservative Des Moines radio show. But Donna just couldn't help herself. The very thought of Barack Obama sent her into a paroxysm of anger. He was going to destroy the country, she said. He was a joke, she said, winding herself up, searching for something outrageous that no one had yet said about the President of the United States. Finally, she found it: "I would vote for Charles Manson before this guy," and she pledged her support to Bachmann.